This tool works on any version of Windows, starting from Windows Vista and up to Windows 10. Both 32-bit and 64-bit systems are supported. Windows XP and older systems are not supported. Added new columns: 'Run Only If Network Available' (Yes/No) , 'Multi-Instances Policy'. Added 'Allow Demand Start' column (Yes/No). Added 'Run Task Now' option (Available only when the 'Allow Demand Start' column displays 'Yes'). TaskSchedulerView.exe /scomma "" > "c:\temp\tasks.csv"
The last size/position of the properties window is now saved in the .cfg file. Fixed bug: Some options like "Hide Disabled Tasks" and "Hide Tasks Marked As Hidden" didn't work properly when saving the tasks list from command-line. Added 'Hide Tasks Marked As Hidden' option. Added new options to the 'Quick Filter' feature. Added 'Stop Running Task' option. Fixed bug: The text-box of quick filter disappeared when pressing Enter or Esc key. The properties window is now resizable. Added 'Quick Filter' feature (View -> Use Quick Filter or Ctrl+Q). When it's turned on, you can type a string in the text-box added under the toolbar and TaskSchedulerView will instantly filter the task items, showing only lines that contain the string you typed. Added 'Running User Account' column, which shows the user account that will be used for running the task. Added 'Highest Privileges Run' column - Displays 'Yes' if the task run with highest privileges. Added 'Align Numeric Columns To Right' option. Added 'Save All Items' (Shift+Ctrl+S). Added 'Copy Task XML' option (Ctrl+M), which copies to the clipboard the full XML of the task. This XML contains all task settings, including fields that are not displayed in the main table of TaskSchedulerView. Added 'Auto Size Columns On Load' option. The Refresh action (F5) is now smooth, without clearing and loading again the entire tasks list. Added 'Running Instances' column, which shows the number of instances of this task that are currently running. Added 'Task Owner' column, which displays the Windows user that owns the task. Added 'Priority' column, which displays the priority level of the task. Priority level 0 is the highest priority, and priority level 10 is the lowest priority. The default value is 7. Added 'Open Windows Task Scheduler' option (Under the Help menu). Added 'Hide Tasks In Microsoft Folders' option. 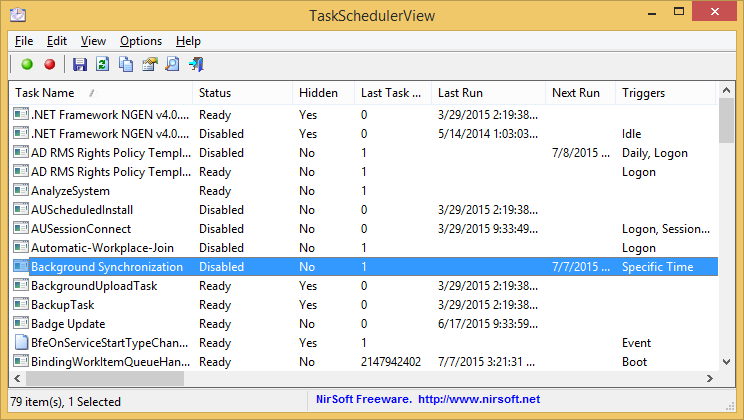 After running TaskSchedulerView, the main window displays the details of most tasks from the Task Scheduler of Windows. However, some of the tasks cannot be accessed without full administrator privileges. In order to view all tasks, you can easily run TaskSchedulerView as Administrator by pressing Ctrl+F11. Inside the main window of TaskSchedulerView, you can easily select one or more tasks, and then export them to text/comma-delimited/tab-delimited/html/xml file (By using the 'Save Selected Items' option) or copy the selected tasks to the clipboard and then paste them to Excel or other application. You can also disable or enable the selected tasks. Be aware that some of the tasks can only be disabled/enabled if you run TaskSchedulerView as Administrator. TaskSchedulerView also allows you to view and disable/enabled the tasks of a remote computer, as long as you have permission to do that. In order to connect a remote computer, simply press F9 (Advanced Options), choose to connect a remote computer, and then type the computer name. There is also an option to start the Remote Registry service on the remote computer. This option is needed only if you want to get the information about COM handlers, which is loaded from Registry. Task Name: The name of the task. Status:The status of the task: Ready, Running, or Disabled. Hidden:Specifies whether the task is hidden (Yes/No). Last Task Result:Specifies the return code from the last time the task was run. Last Run:Specifies the date/time that the task was last run. Next Run:Specifies the next time that the task is scheduled to run. Triggers:Specifies the trigger types of the task: Event, Specific Time, Daily, Weekly, Monthly, Monthly Day-Of-Week, Idle, Task Registration, Boot, Logon, Session State Change. Run On Boot:Specifies whether the task runs on computer boot (Yes/No). Run On Logon:Specifies whether the task runs on Windows logon (Yes/No). Run On Event:Specifies whether the task runs on Windows event. If it runs on event, the event string is specified. Run Daily:Specifies whether the task runs daily. Run Weekly:Specifies whether the task runs weekly. Run Monthly:Specifies whether the task runs monthly. Missed Runs:Specifies the number of missed runs. Task Folder:Specifies the full path of task folder. Action Types:Specifies the action types of this task: Run EXE, COM Handler, Send Email, Show Message. Executable File:Specifies the executable filename to run (For 'Run EXE' action). Executable Arguments:Specifies the executable arguments(For 'Run EXE' action). COM Handler Filename:Specifies the filename of COM Handler (For 'COM Handler' action). COM Handler Description:Specifies the description of the COM Handler file (For 'COM Handler' action). COM Handler Class:Specifies the class ID of the COM Handler file (For 'COM Handler' action). Description:The description of the task. Task Owner:Specifies the Windows user that owns the task. Running User Account:Specifies the user account that will be used for running the task. Highest Privileges Run:Displays 'Yes' if the task run with highest privileges. Priority:Specifies the priority level of the task. Priority level 0 is the highest priority, and priority level 10 is the lowest priority. The default value is 7. /stext <Filename> Save the tasks list into a simple text file. /stab <Filename> Save the tasks list into a tab-delimited text file. /scomma <Filename> Save the tasks list into a comma-delimited text file (csv). /stabular <Filename> Save the tasks list into a tabular text file. /shtml <Filename> Save the tasks list into HTML file (Horizontal). /sverhtml <Filename> Save the tasks list into HTML file (Vertical). /sxml <Filename> Save the tasks list into XML file. /sort <column> This command-line option can be used with other save options for sorting by the desired column. The <column> parameter can specify the column index (0 for the first column, 1 for the second column, and so on) or the name of the column, like "Task Name" and "Last Run". You can specify the '~' prefix character (e.g: "~Status") if you want to sort in descending order. You can put multiple /sort in the command-line if you want to sort by multiple columns. A file named TaskSchedulerView_lng.ini will be created in the folder of TaskSchedulerView utility. After you finish the translation, Run TaskSchedulerView, and all translated strings will be loaded from the language file. If you want to run TaskSchedulerView without the translation, simply rename the language file, or move it to another folder. TaskSchedulerView is also available in other languages. In order to change the language of TaskSchedulerView, download the appropriate language zip file, extract the 'taskschedulerview_lng.ini', and put it in the same folder that you Installed TaskSchedulerView utility.